If you follow me on Twitter, then you would have heard me profess my love of Cybercandy and my love of Pretzel M&Ms. 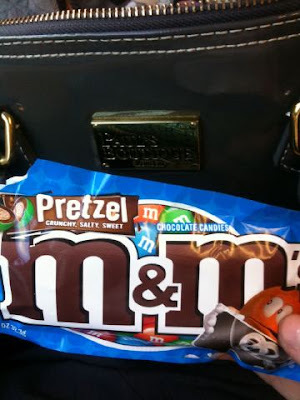 The hard sugar shell, chocolate and then pretzel are a sugary mouthful of heaven and I knew I had to pay homage. 1, Add the butter, sugar, syrup, salt and a couple of tablespoons of cold water to a medium sized saucepan. Stir gently over a low heat until everything has dissolved. 2, Clip on a sugar thermometer and turn the heat up to medium/medium-high. 3, Prepare a baking tray with a layer of grease proof baking paper. 4, Keep an eye on the toffee, stir it gently occasionally and bring it up to 145o/c or hard crack stage. 5, When it has reached this, carefully remove from the heat, unhook the sugar thermometer and stir in the vanilla and the bicarbonate of soda. Be careful, it will hiss and spit at you. 6, Quickly stir in the pretzels and make sure they are all covered. 7, Tip the entire lot onto your baking sheet and spread as evenly as possible. 9, Cover and leave to cool or pop it in the fridge. 10, Smack it with a rolling pin to make bite size shards when fully cooled. I baked my cakes in three batches of two. I didn’t want to put more than two in my oven at a time due to space and I wanted them cooking evenly. 1, For each batch (two cakes) you want to cream together 190gr of butter and sugar together until pale and fluffy. 4, Fold this until just combined. Don’t mix too much at this stage. 5, Divide the batter into two bowls and add food colouring to each. Bear in mind that the colour of the cake will be brighter than the batter but make them as bright as possible without overbeating. 7, Cool the cakes and make the next two batches in the same way. 8, When you have all six cakes cooled and ready to be iced , trim all the cakes to a six inch diameter and make sure they are level using a cake leveller or a knife and a steady hand. 9, Make one batch of butter cream icing by beating 150gr of butter until really pale and light then fold in 350gr icing sugar with a couple of teaspoons of milk and a couple of drops of vanilla extract. If you want a really white butter cream add the tinest bit of blue food colouring and beat well. I used a skewer to add the food colouring. It’ll offset some of the yellow tinge. 11, Whip up the next batch and give the cake a thin crumb coating. Pop it in the fridge for a couple of hours so the crumb coat sets so your final ice will be all lovely and crumb free. 12, Remove the cake from the fridge and apply the rest of the icing to the cake using an offset spatula. I swirled the top and then used a dessert spoon to lightly drag up the surface of the butter cream to create the stripes. This month’s We Should Cocoa is held by Chele at the Chocolate Teapot who has challenged us to make a swiss roll or a roulade. You can see last month’s round up here for the marzipan challenge. I was born in the Chinese year of the tiger. Also due to the time of year of my birth the element of fire is also attached to me. This means I am a Fire Tiger. Jim is a Water Pig. I’m happy with this. Jim? Not so much. Water Pig. Giggle. I once sulked for a good few hours because we didn’t get to see the tigers at London Zoo. I was 23. I’m never going back to London Zoo. 2, Gently fold the sifted flour into the beaten sugar and eggs until just incorporated. 3, Take four tablespoons of the batter and divide it between two bowls. 5, Transfer the coloured and cocoa-ed batter into separate sandwich bags, snip a tiny bit off each corner and pipe ‘tiger stripes’ onto a lined and greased Swiss roll tin and pop into the freezer. I actually used a deep cookie tin to do mine and then, when cooked, trimmed it into a rectangle to roll. 6, When the tiger stripes are frozen solid, gently spoon the remaining cake batter over the top and smooth gently with a wet spoon. Sprinkle the orange zest evenly over the raw batter. 7, Bake for 7-10 minutes until springy to the touch and starting to go golden brown. 9, When the Swiss roll has cooled, gently unroll it, remove the inside piece of greaseproof and smooth on a layer of chocolate butter cream and top that with some orange curd. 10, Re-roll the whole thing carefully and remove the outside layer of greaseproof. The combination of hot weather and those quick heavy showers we’ve had over the last couple of weekends have really made the garden burst into fruit and vegetable heaven. I’m already excited about picking the fruits of our labour! Plus mystery bush has flowered this year! Check out these beauties! I had to hold up the stems because the flower heads are so heavy! I was quite happily sitting in the bath last night, debit card in my mouth, flicking about on the internet, whilst repeating the mantra “Do. Not. Drop. iPhone. In. Bath”, and booking my best friend’s birthday surprise. Birthdays are cool. Well, other peoples are. I always book for me and the best friend to go and do something rather than buying her a present. Memories are better, sometimes, than gifts. We’ve been on the London Eye, been to the Ice Bar and this year, I have just found the perfect thing for us to do. But it’s a secret. So here is my big 1st birthday blog cake. It looks pretty plain but looks can be deceiving… Hold back the hair. Make a wish. Totally wish I could share this with all the awesome people I’ve met through food blogging. We took it to a BBQ and eight of us barely managed half of it. Recipe to follow. I had problems writing this post. What do you write about bundts? I’ve never been one to dip into the history of certain cakes and I don’t want to bore you. As a substitute of writing this post, I have spent the past week (or so) replacing words in songs with the word ‘bundt’. It definitely hasn’t helped with the writing. 7, When an inserted skewer comes out clean, remove them from the oven and turn onto a wire cooling rack.